Radial research of organs of the urinary and reproductive system usually starts with a review of the radiographs of the kidneys and all urinary tract. However, this method gives doctors only part of the necessary information about the status of these bodies and ability to perform its function. Applied a set of more precise methods, e.g., x-rays of the bladder, which allow to study precisely the specific area of the urinary tract. For this purpose, the ability of the kidneys to capture from the blood contrast agent, which then enter into the urine, allowing you to explore such formations as the renal calyx system, pelvis, ureters and bladder. This study is called excretory (intravenous) urography. Alternatively, the study considers the introduction of a contrast medium through the urethra itself. In this case, means that made by cystography or x-ray of the bladder. Because the concentration of contrast in this case is much higher, you get a shadow high intensity, which stands out against the bones. 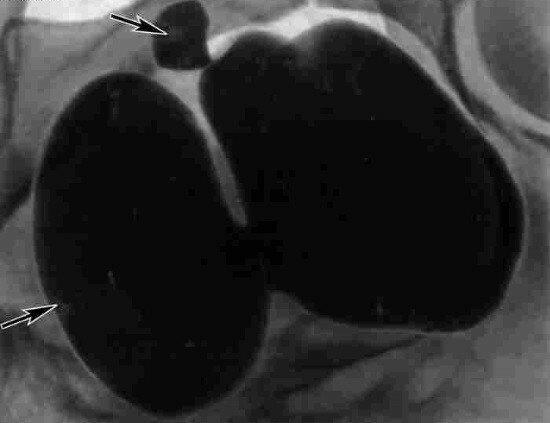 In the case of a normal x-ray picture of the shadow of the bladder is homogeneous, its outline smooth and correct. If inside are stones or tumor, the changes or uniformity of shade or the clarity and smoothness of contours. Suspected diverticula of the bladder. Also, this procedure can assign after injuries of the abdomen, when accurate information about the condition of bladder no. Carried her in violation of the innervation of the body that is manifested in different forms of violation of monotoca. It is convenient in the diagnosis of urolithiasis, recurrent cystitis. In the latter case, cystography can also prevent the development of tumors, as in the case of chronic develops hypertrophy of the bladder walls, which can develop cancer. When urinating contrast agent passes from the bladder into the urethra. The survey, which is carried out at this time, called missiona cystography. It allows to obtain an image of the initial divisions of the urethra and to evaluate the work of the sphincter of the bladder. If there is suspicion of the presence of obstacles to the outflow of urine from the bladder, doctors radiometrically determine the volume of remaining urine. This is because in such cases, after urinating inside the bladder remains a certain amount of urine. To measure the amount the patient is administered a radiopharmaceutical and a half or two hours for measurements of radiation intensity over bladder. After the patient is asked to empty it, and then perform measurement of the radiation level, and calculate the residual urine volume. The most common and informative alternative to the study ultrasound sonography. However, sometimes these methods are used together, as this gives you the opportunity to obtain a complete picture of the pathological process. As seen in the pictures? One of the main pathologies that are detected during x-ray examination, are tumors. Cysts or tumors can be a long time to develop secretly, without disrupting the functioning of body systems. The most informative method used for the diagnosis of bladder tumors is a CT scanner. An accurate diagnosis for cancer the doctors can put only after the cystoscopy with biopsy, however, there are a number of factors that make ray study is needed. First, the malignancy of papillomas most often occurs in the depths of the body wall and it can’t install investigating biopsy. Second, cystoscopy does not provide information about the tumor invasion into the wall and adjacent organs, does not show the presence of metastases in regional lymph nodes. So if you have a suspected cancer diagnostic finding it is better to start with the radiological diagnosis. Upon detection of the artifact it is impossible to talk about it benign or malignant. 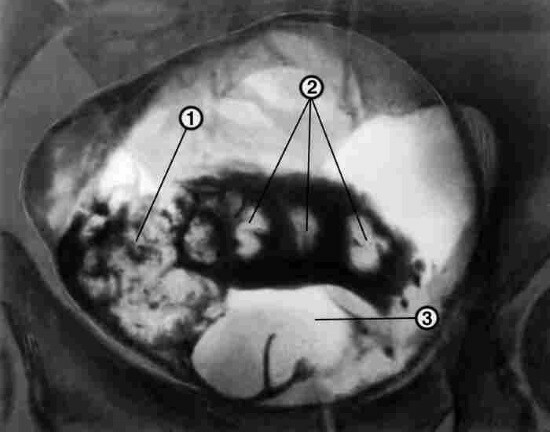 A reliable sign of cancer on radiographs is its germination deep in the bladder wall and invasion in paravesical fiber. Tomography is valuable because it can precisely visualize the tumor bottom and top of the bladder. Cystography is also able to visualize the process, however, it must be performed double contrast. 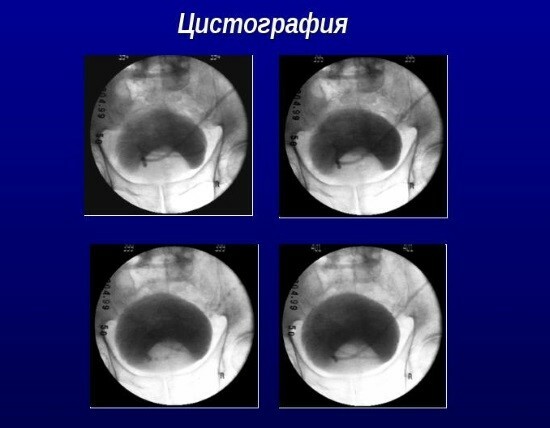 Another use of radiography in the study of bladder – diagnosis of congenital anomalies. The most common of these is a diverticulum. It is a abdominal education, which connects with the bladder through a thin neck. Best of all it is determined at the cystography. There may be ureterocele. At first glance, it can be similar to the diverticulum, however, its main difference is that it does not lie in the direction from bodies, and is, in fact, a hernia of the ureter. The study is quite safe and can be performed in all patients except pregnant women, as it is impossible to prevent the influence of x-rays on the fetus. Zistografii in which a contrast agent is injected into the bladder through the urethra, it is not recommended to people with acute infectious diseases and immunocompromised patients. You should not do this procedure if you suspect traumatic rupture of the organ, in this case you should assign excretory urography. All research is carried out on an empty stomach. The patient should be informed beforehand about the procedure, the physician needs to gather a detailed history, to clarify the tolerance of iodine, and preparations containing it if you plan urography. The night before, the patient must cleanse the bowel, the procedure was repeated on the morning of the study. In a radiology Department the person must come on an empty stomach. The patient is then laid on the back, and conduct a panoramic radiograph. After embarking on additional research methods.